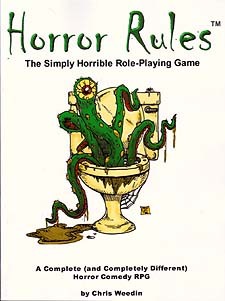 A fun, fast paced, easy-to-learn horror comedy roleplaying game, Horror Rules is based on the best (and worst) scary movies and books and packed with all your favourite characters, cliches and cut-ups. Great for experienced and novice gamers alike, this rulebook contains everything you need to play... and more! With plenty of action, scares and tongue-in-cheek mayhem, it's guaranteed to make you die laughing. * Pick From Six Original Character Types! * Save the Day With Character Powers! * Reward Your Stupidity With Stupid Thing Points! * Watch Mostly or Partially Dead Foes Return! * Enjoy Hilarious Skill and Combat Flubs!